Is it possible to rebuild your life after divorce? And if yes, how should you start, what can you do to move on and heal? After my divorce, I was left alone to deal with the pain and suffering. Instead of living in my home, I found myself in a 300 square foot apartment. Instead of hearing the sounds of my children's feet scampering up the stairs, I heard silence. I did not know how to survive. I was on antidepressants for two years until a hallucination and nightmare convinced me that I must stop. At that time, I never believed that I could have a better life, any life. My sense of loss was deeper than the Grand Canyon. Have you felt that type of despair and isolation? Here are some ways to rebuild your life after divorce. 10k steps are about 5 miles of walking. Which translates into about an hour of walking every day. Shoot for a minimum of 30 minutes. Walking will loosen the burdens of your mind. You will see the sky, trees, a world around you that is much bigger than your personal problems. The fresh air will make you feel better. Divorce is a huge stress on your body. And your body does not deserve it. Your new habit of walking 30 – 60 minutes a day will be the foundation for rebuilding your life. Because every good habit is going to develop into more powerful ways to turn your life around. You might feel like you were cut out of your own family portrait. Your children do not live with you. If you are estranged from your children, read this. Your home is no longer your home. In fact, the court forced you to leave your house. Whether you live in your car, a garage or your friend's basement. You have to start pushing back, for yourself, to recover. What is the simplest exercise you can do in a small space? Even if you can only do one, do one push up. Do push ups 10 minutes a day while you are watching tv or when you have a break. Most likely, you have more time on your hand after divorce. You lost your sense of identity and sometimes it feels like you do not exist. Push ups and getting stronger will undo those feelings and help boost your confidence. Can you do 100 push ups today? If not, start working on it till you can do 100 push ups in ten minutes. 3. How Can You Boost Your Mood? To recover from divorce, you have to start building up your strength. Lift weights to lift your mood. If you are capable of doing deadlifts and squats, great. There is nothing quite like squats, deadlifts and push ups to transform your mood. If not, you can start with simpler bodyweight exercises or weight training. You are suffering and in tremendous pain. But, you want to find something in your life to say thank you about. Whether it is to thank your lucky stars, nature or your higher power. There must be something in your life that is still working. It might be your job, your physical body, your friends, your family. Find the blessings in your life. Because if you can find one, you can find more. And this will help to lessen the deep loss of divorce. Saying thank you for the good in your life is a powerful way to rebuild your life after divorce or separation. Become a writer, of a hit movie, about your own life. Right now, you might feel lost and hopeless. That is not how you want the film of your life to turn out. You are the star and hero of your own movie. But now, you have to become proactive and start writing. Get a notebook or a journal and start describing the life you want to have going forward. As you write, you will get new ideas of what you can do to improve your situation. Your new goals will give you relief from obsessing over your divorce. And your new script can inspire you to action. You have cried enough, mourned enough, told your story enough. To possible everyone who will listen. And they will stop listening. There is only so much that people can bear. Stop talking about your woes and start writing about a new future. A new life that you will paint into existence with your words. I thought my life was over after divorce. And that I could never survive, let alone create a new life. Your life will be different for a long time, most likely forever, that is for sure. But you do not have to stay mired in grief for years, or even worse, decades. While I am still a work in progress, these 5 habits helped me create a new life after divorce. 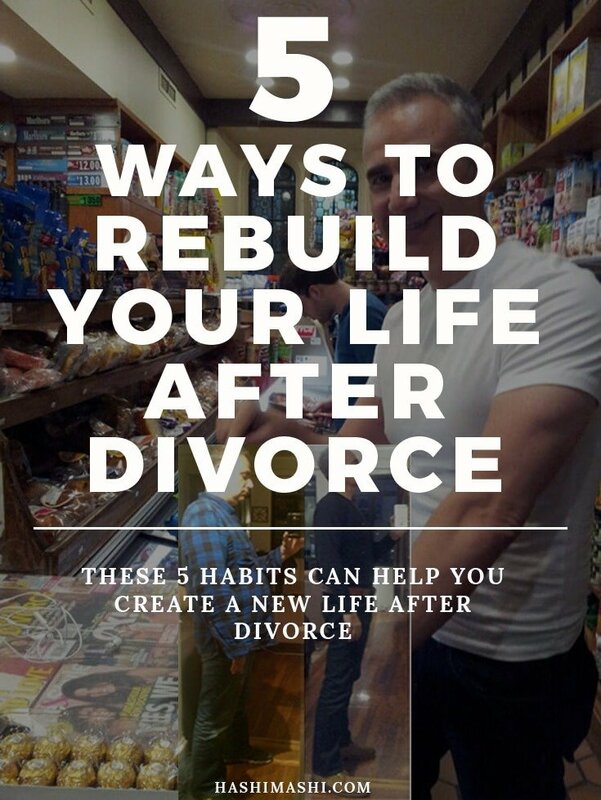 I hope these 5 simple habits can be of help to rebuild your life after divorce or separation.